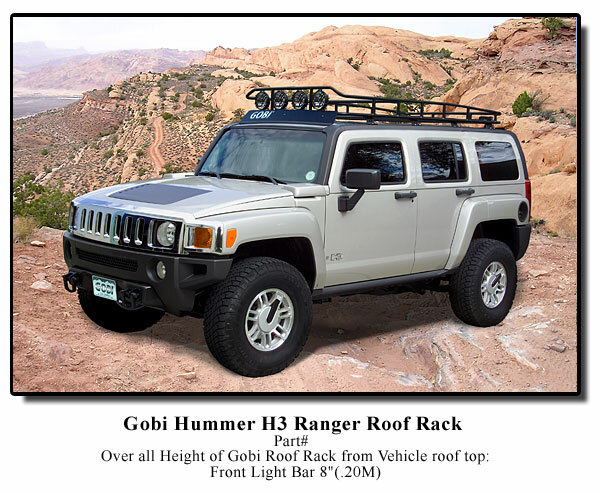 The all new H3 Gobi roof rack enhances the very structure of the H3's tough off road capabilities while holding firm to quality and total functionality. The tough 1" tubular steel construction wraps neatly around a 26sq.ft. (2.41m2) fully welded-in, easily traversable expanded metal deck with 8 anchor points supporting the Gobi rack to the OEM roof tracks, forming an inseparable factory bond. Two fixed 1-1/8" cross bars come standard for all your Outdoor Sport attachment needs. The super tough epoxy undercoating and Black powder top coat finishes the Gobi rack to produce not only a stunning visual but an asset for countless off and on road journeys for years to come. Comes with Stainless steel hardware and easy to follow instructions. Fixed front light bar holds up to 4 lights and 2 independent rear light bars (1-light per bar) (Original factory cross bars must be removed prior to installation). Height of Vehicle after rack is installed with factory equipped 33" tires 6'-11"